I know that I am mortal by nature, and ephemeral; but when I trace at my pleasure the windings to and fro of the heavenly bodies I no longer touch the earth with my feet: I stand in the presence of Zeus himself and take my fill of ambrosia, food of the gods.  Claudius Ptolemy (c.AD 87c.150), mathematician, astronomer, geographer, astrologer. Perhaps the greatest reason for the retention of the errant geocentric model came from the unanswerable questions based on "logical reasoning" or the lack of empirical evidence which formed the basis of challenges to the theory of a sun-centered universe. If the Earth really moved around the sun, then wouldn't we see the stars move? This phenomena is called parallax and a star's parallax motion is simply a reflection of the Earth's orbital motion, but is much too small to be seen without a telescope due to the extreme distance to the stars (the first parallax would not be observed until 1837 by Friedrich Bessel using the star 61 Cygni). Yet, the seemingly inherent logic of this as well as many other questions, were used to disprove the theory of a sun-centered solar system. At right is an illustration of the Ptolemaic Universe, showing the secondary motion (epicycles) of the planets. By the Middle Ages, such ideas took on a new power as the philosophy of Aristotle (newly rediscovered in Europe) was wedded to Medieval theology in the great synthesis of Christianity and Reason undertaken by philsopher-theologians such as Thomas Aquinas. The Prime Mover of Aristotle's universe became the God of Christian theology, the outermost sphere of the Prime Mover became identified with the Christian Heaven, and the position of the Earth at the center of it all was understood in terms of the concern that the Christian God had for the affairs of mankind. Yet, Copernicus' road was a path that was both hesitant and cautious, likely due to the fear of persecution; he never fully accepted the favorable reception his work garnered nor the invitations sent him to openly present his theory. His work was published only at the time of his death, in 1543, and then by someone other than himself. Though it had been welcomed with great interest in his time, Copernicus' theory would not be substantially revived until an instructor of mathematics and astronomy at Tübingen, Michael Maestlin, began relating it in privateMaestlin had written a popular textbook which was a geocentric-based work and therefore, accorded with the current religious beliefs of the timesto a handful of select graduate students. For one young student, Copernicus' work would heavily influence the direction his own life's work would take. That student was Johannes Kepler. Kepler would doubtlessly have agreed with Shaw, for the more he studied the writings and teachings of his as well as other religions, the more he found himself frustrated and at odds with the proper way to worship God, until no one religion made sense. This aspect of Kepler's life would become important over the years as he began to bring the science of his theories towards his own style of worship; a union that would later bring him trouble. However, that was still in the future and for the moment, it was 1594 and a most important invitation was received at the university in Tübingen. 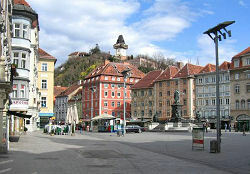 Shown at left is an image of the Main square in Graz courtesy the TripAdvisor website. The Protestant seminary in Graz (capital city in the Styria province of southeastern Austria) had just lost its instructor in mathematics and asked the university in Tübingen if they would recommend someone to replace him. In the early part of 1594 they did so by asking Johannes Kepler to fill the vacancy. Astonished and hesitant at first Kepler, now twenty-three years old, finally decided to accept the offer and so bidding farewell to Tübingen for what he believed to be no more than one or two years, headed for Graz, arriving there on April 11, 1594. However, Kepler was no fool and there existed a more earthly and less ethereal reason for him to continue his astrology; as the business of his predictions continued with a very good record of accuracy, so too did the income they brought. So he continued making them and writing his calenders. 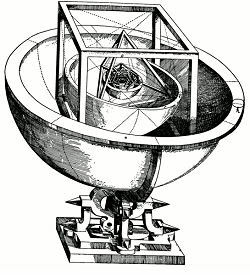 However, Kepler never loss track of the passion that had now taken hold and therefore, kept his mind focused on his primary intereststhe number and pattern of movements regarding the objects within the heavens above. In 1596 Kepler returned to his homeland in Swabia, finding that his fame had spread, having reached this area a year or so prior to his visit. In a granted two-months leave of absence from Graz (which actually lasted seven months) Kepler consulted with his friend and mentor Michael Maestlin who agreed with Kepler on the publishing of a book which would present his theories of the planetary orbits, based on his five Platonic solids which he had worked hard on while in Graz. 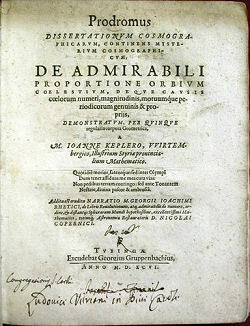 Maestlin, impressed with the ingenuity of Kepler's ideas, agreed to oversee this work, editing the manuscript where needed and in the spring of 1597 the book, entitled Mysterium Cosmographicum or The Mystery of the Universe (shortened from its original 28 word Latin title) began publication from Tübingen. 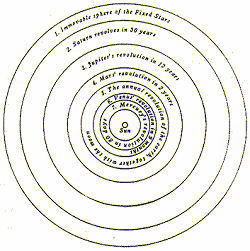 Though Kepler's theory and work in planetary orbits and Platonic solids was incorrect (their placement within each other and hence, the fact that they were as close as they were, owing as much to coincidence as to deliberate calculation), within its pages there exist the first inkling into one of his later theoretical lawsthe law of planetary motiona concept that was an inherent part of his quest in finding a relationship between the time a planet orbits the sun and the distance it is from the sun; the theory would see the light of day twenty-five years later. The book also posed the idea of a force or "vigor", as Kepler put it, that originated from the sun and drove the planets through their orbits, the first inklings into a concept that would not become apparent until the time of Sir Issac Newton's work on the laws of gravity. Events over the next three years would set the stage for the high and low points of Kepler's life, much of it a result of the turbulent religious strife prevalent during the period in which he lived. 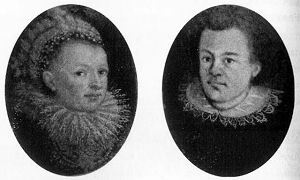 In the later part of 1595, Kepler had met and fell in love with Barbara Müller, daughter of a wealthy merchant who had already twice married. Kepler ask for her hand early on (January of 1596), but it would be almost eighteen months before he would finally be able to marry her, their wedding not taking place until April 27, 1597. Though Kepler was obviously pleased with the union, events began to unfold that would tax his spirits: in 1598 and 1599 respectively, Barbara would give birth first to a boy and then a girl, both of whom did not survive infancy due to spinal meningitis. His marriage, as was the custom of the period, was as much for love as it was for the material benefits that Barbara's wealthy family might bring, but these were not forthcoming as Kepler was later to admit. Seen at right are the portraits of Kepler and his wife in oval medallions, from Wikipedia. Original paintings are oil on copper, 7 cm x 5 cm. Scanned from Kepler's Witch by James A. Connor. In the meantime, even more ominous storm clouds appeared on the horizion when, in 1596, Archduke Ferdinand came to power in Styria. An ardent catholic, Ferdinand went about cleaning house by ridding Styria of its Prostestant teachers and theologians under a final edict in 1598 that gave them eight days to leave or be put to death. On the eight day they did so, moving out of the area, Kepler included. They waited for word that they could return to the region but that was not forthcoming save for one; in less than a month's time Johannes Kepler was allowed to return to Styria, but he was well aware of the fact that his days at Graz were numbered, having already written to a friend that neither he nor his wife looked forward to leaving Styria. With the stage now set, the year 1600 exploded onto the historical scene as numerous riots began breaking out all over the region, tensions running at their highest point. Then, in the summer of that year, the Counter Reformation again reared its ugly head; luckily for science that year also marked an event that would forever change the face of astronomy, the meeting of Johannes Kepler and Tycho Brahe. Thus on February 4, 1600, Kepler, carrying a note of high recommendation written by Hoffman, rode northward toward Benatky Castle in the company of one of Tycho's sons. For the twenty-nine year old Kepler, it had been a long and patient wait, but now at last he could look forward to furthering his theories using Europe's best available instruments, under the world's greatest astronomer, in whose possession were the most accurate and detailed observations that had ever been made, acheivements which were acomplished without the invention that was to shortly permeate throughout Europe and revolutionize the world of astronomy: the telescope. Before venturing further, let us now look to the individual who, at this time, was regarded as the foremost astronomer in Europe, indeed, in the entire worldTycho Brahe. 1. There were of course, other reasons behind the retention of the geocentric model outside the bounds of "logical reasoning". It should be pointed out that by the 16th century, religion had embraced and expanded upon the earlier works regarding an earth-centered system. The Apollonian Model particularly shows the Earth at the center of the universe with a band of stars all around. Inside the misnamed "solar" system all the planets orbit the sun and the moon and the stars orbit the Earth. In addition, the church was able to read the proof of this geocentric system (that the earth is fixed and immovable and lies at the center of all things) from within the pages of the Bible itself. This was a scriptural based concept and the most important biblical quote supporting it was found in the Book of Joshua, 10:12-13, wherein the Amorites are defeated as a result of the miracle of Joshua (also referenced in the book of Habakkuk, 3:11). In 1 Chronicles 16:30 the Earth is shown to remain unmovable: tremble before him, all earth; yea, the world stands firm, never to be moved. Further references that gave theologians proof of earth's imobility are found in Psalms 93:1 and Psalms 96:10. See: Glenn Elert's The Scriptural Basis for a Geocentric Cosmology for an interesting look into this aspect of science and religion, © 1992-2008. 2. 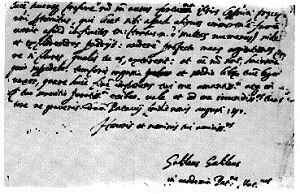 Galileo's silence to Kepler's second letter has been attibuted to his non-involvement within astronomy at this time, Galileo did not reply, possibly because he was not yet fully interested in astronomy. See: BRIEF BIOGRAPHY OF JOHANNES KEPLER. However, author D. C. Knight, in Johannes Kepler And Planetary Motion, p.36 (see  below) says But Galileo, who could be testy and difficult even jealous at times remained silent. What is important at this juncture is that Galileo's first letter to Kepler contains the statement that he (Galileo) has supported Copernicus' theory for some years. See: the Galileo Timeline at Rice University, which places the beginning of his support for Copernicus' theory in circa 1595. Ptolemaic system Geocentrism and rival systems from above. The Universe of Aristotle and Ptolemy from the website Astronomy 161, The Solar System. Also see The Heliocentric System. Both articles are lecture notes from the Astrowiki website. HEATH, SIR THOMAS K.C.B., ScD., F.R.S. Aristarchus of Samos the Ancient Copernicus, History of Greek Astronomy to Aristarchus Together with Aristarchus' Treatise on the Sizes and Distances of the Sun and Moon, New Greek Text with Translation and Notes, p.302 et.seq., Cambridge Oxford at the Clarendon Press, 1913. This is the full text version from the Internet Archive Also see: Aristarchus of Samos and the Heliocentric Universe Includes other sites of interest to the reader. Holton, Gerald Johannes Kepler's Universe: Its Physics and Metaphysics, American Journal of Physics 24 (May 1956): 340-351. Knight, David C. Johannes Kepler And Planetary Motion (1962), p.18 Publisher & Copyrightowner - Franklin Watts, Inc. Library of Congress Catalog Card Number: 6210380. This is a interactive flip book with a compatible text version located on this page Access and electronic publication formats made available through the excellent efforts of the Internet Archive. Kusukawa, Sachiko Kepler and Astrology Copyright 1999, Department of History and Philosophy of Science of the University of Cambridge. All Rights Reserved. Kollerstrom, Nick Kepler's Belief in Astrology © Nick Kollerstom, 2006. This essay is an updated version of one printed in 'History and Astrology: Clio and Urania Confer,' 1989, Ed. A. Kitson. Davidson, Michael W. & Florida State University Molecular Expressions: Science, Optics and You - Timeline - Ptolemy. The website is maintained by the Graphics & Web Programming Team in collaboration with Optical Microscopy at the National High Magnetic Field Laboratory. The Latin Library This web page is in Latin and is an archieve of various texts written by many historical figures, such as Galileo, Corvinus, Cicero, Dante and others. It is a wonderful resource and starting point for classical studies. Tynsky Chram One of Prague's most easily-recognizeable landmarks, Tyn Cathedral also houses the tomb of Tycho Brahe, the Danish astronomer who died under mysterious circumstances while in the services of Emperor Rudolph II in 1601.